Young Humanists graphic designer Kathleen van Geete reflects on a spirited weekend of humanist discussion and debate in the Netherlands. 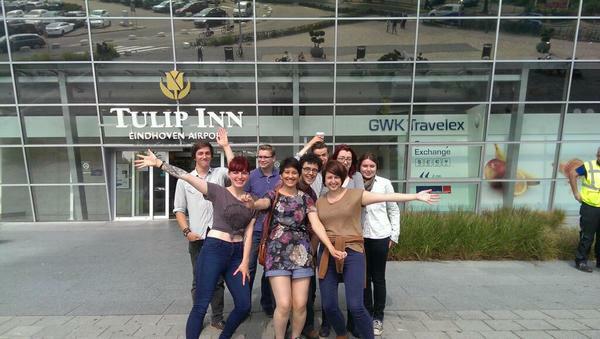 In early August, I was lucky to be one of several humanists despatched to the outskirts of Eindhoven in the Netherlands to represent the Young Humanists, the 18-35s section of the British Humanist Association, at a special Humanist Weekend event organised for young people like us from around the world. It was organised by the International Humanist and Ethical Youth Organisation (IHEYO), the youth wing of the the International Humanist and Ethical Union, and its purpose was straightforward: to get to know each other better and discuss our role in the humanist movement. Before we left for the reclusive Dutch woodlands, each of us had the chore of trying to convince our friends, families, and colleagues that we were not embarking on an initiation escapade to some remote cult gathering. In fact, our weekend was quite the opposite. Once we arrived at De Kievit, our lodge for the duration of our trip, and met up with humanists from other parts of the world, it was obvious that our discussions and activities would keep well away from all things spiritual, fanciful, and superficial. It all started with a challenge. The weekend’s organiser, Dutch humanist Lenart Kolenberg, presented our theme for the weekend: to consider the Amsterdam Declaration of 1952 – the first international statement of its kind, setting out the values and principles of contemporary Humanism – and to consider what, if anything, we would add to it. This was a daunting question, but the weekend’s lectures and discussions would all serve this theme, we were assured. And then Lennart asked us something else, with something of a grin on his face. He wanted to know whether we as young humanists – ranging in age from older teenagers through to young adults, all at different stages in our lives – considered it our job to ‘save the world’. We had the pleasure of hearing from five enthusiastic speakers. Kicking all our hangovers out the door first thing on Saturday morning was Leon Korteweg, who drilled down into the subject of ‘Wikipedia activism’. His work, through Guerrilla Skepticism, aims to provide accurate and well-cited information about Humanism and related topics to Wikipedia pages. Due to Wikipedia’s status as sixth most popular website in the world’ , Leon’s group aims to ensure that all information about humanist and skeptic topics on the online encyclopaedia are accurate and, importantly, verifiable, in as many languages as possible. A secondary aim for the group is to ensure that new pages about notable humanist and non-religious topics are added to the encyclopaedia where necessary, to promote public awareness of these topics. In a later talk, the BHA’s Campaigns Manager, Richy Thompson, joined with IHEU Director of Communications Bob Churchill to offer some insights into the work of both organisations over the past 12 months and their lives own as ‘professional humanists’. Richy spoke about the BHA’s campaigns on various secularist and public ethical issues in the last month, such as its campaign for a compassionate assisted dying law, to promote understanding of Humanism through schools, and to raise awareness of issues around the state funding of religious schools and quack medicine such as homeopathy. Bob spoke about IHEU’s development into a formidable international humanist society in its own right, engaged in international lobbying through organisations like the UN and the Council of Europe, as well as through in-depth research like the annual Freedom of Thought Report. Guests at the Humanist Weekend also learned about the pivotal role IHEU played in supporting Bangladeshi humanists and atheists under threat from religious extremists. Just a day previous, the Bangladeshi blogger Niloy Neel had been brutally killed in his own home. Niloy was one of 84 humanist writers marked for death in a prominent ‘hit list’ circulated among Islamic extremists in Bangladesh. IHEU helped to coordinate activists on the ground in Bangladesh and, working with international groups like the BHA, break the story about Niloy’s horrible murder. It offers similar support, in many cases directly to individuals under threat, in places like Malaysia and Egypt as well. One delegate asked Bob how we, as young people, could help to support the humanist cause, particularly around complex international issues like these. Bob’s advice was enlightening. In his role at IHEU, Bob has had a hand in the formation and development of a number of humanist societies, including successful national humanist groups in Africa. His reasoning was simple: focus on effectively managing your own small local groups. Religious extremists, out to do harm, tend to form incredibly well-networked and professional groups. Even slick terrorist organisations like the Islamic State began as small hives of well-trained, dedicated activists. Humanists need to provide an opposite force to these evils. Even small voluntary tasks for larger organisations in your area can assist the cause dramatically, Bob explained. While some campaigns will not necessarily need voluntary assistance in the beginning, they can grow rapidly and come to rely on the work of volunteers. He gave as an example of this, the End Blasphemy Laws campaign, launched earlier this year shortly after the Charlie Hebdo killings, which has already helped to stimulate repeals in two European countries, and the Freedom of Thought Report, which has become an increasingly effective diplomatic tool and which is assembled with the help of dozens of international volunteers. Active socialising, shall we say, on Saturday night led to a rough start on Sunday for everyone, but our speaker, David Althaus, roused us with a stirring talk on ‘Effective Altruism’. He asked his audience to consider how best it could give money to help the most people and make the biggest impact, which to me seemed to figure with Lennart’s original question of us on the Friday: what more can humanists stand for? What can we do to ‘save the world’? The topic was controversial, raising a number of questions about assumptions of effectiveness. As a group, we were forced to ask ourselves: which charities did we feel were the most active and beneficial to society? Could these be ranked, as many are by effective altruist groups like Giving What We Can? The audience was divided, but it seemed like our hunger for solving ethical issues and being a force for good in society had been stoked. Our final speaker Hannah Blok initiated a careful discussion about technology, particularly in the context of dangers to our human rights: breaches of security, Internet surveillance, and the increasing commoditisation of personal data. Her advice to us, as activists working in different groups all over Europe, was to consider our procedures and data management activities carefully. Hannah described herself as suspicious and meticulous, and seemed to encourage us to be the same. It seemed we were agreed, as a group, on the subject of privacy. Privacy was paramount. Our members and activists were precious to us, and to the goals we hoped to achieve. We had to set ourselves a high challenge: to approach, with open arms, the potential uses of new technology to grow our organisations and expand our footprint, while being mindful of the human beings whose lives are described in the data this technology will gather over time. I found the whole experience electrifying. I spent the weekend surrounded by people whose goals and interests were similar to my own, but who were all thoroughly individual, unique, and even challenging. We discussed everything. We inhaled subjects like marriage law, and its variances from state to state. We probed national politics and international issues and learned from each other’s experiences of both. Invariably, things on our mind came up a lot. Children, and child-raising. Our local groups’ activities. Our campaigns, and how our emphases on these seemed to vary from country to country. Penal reform, education. But there was real human connection, too. There was the sheer joy learning about how people’s ways of living and thinking could be so similar, and yet so different, throughout Europe. Most of us walked away not just with a wealth of knowledge which we could take to our own organisations, and to humanist campaigning, but a deeper and richer understanding of what makes us so similar, so different, and what unites us as humanists. Bob and Richy had said something in their session which struck me, and it went through my head again as we left De Kieveit. They said how their careers in Humanism had much less to do with arguing against religion than questioning, and improving, the cultural and political frameworks to which their lives were anchored. Humanism was not a response to anything. It was – and had to be – a mission statement, a challenge, a call for a better way of living and running our societies. It was then I realised that this what Lennart had been getting at, when he first sat us down with our copies of the Amsterdam Declaration. Why bother to make a ‘declaration’ anyway, I suspect many of us wondered. But it had become clear to me, over wine and long discussions, over fireside chats and the smell of forest pine: Humanism was a movement of people concerned with the betterment of our world. Not with creed or class, or race or religion, or any of these distractions, but a society built on solid ethical principles like respect for individual dignity and recognition of our place in a human community. It was about seeing the world for what it is, and acknowledging that while our lives are temporary, our world will outlast us. The Humanist Weekend in Esbeek was a great chance to meet new and interesting people. I had never been to an event like this, and didn’t know anyone prior to boarding my plane, so I was suitably anxious. However, the humanist youths from all over Europe made me feel welcome, and I felt I could initiate a conversation with any of them. This trip has inspired me to give more of my time to the Young Humanists in the UK, and has also helped me realise how successful humanism can be in a society, like the Netherlands. Although I managed to get stung on the lip by one of the many wasps, there were many great discussions and conversations between everyone, and I enjoyed every minute of it! Firstly I’d like to say thanks to the organisers, Remmelt, Jorg, Els,Lennart and anyone else at the forefront. Thanks to everyone else including the people in the background, the speakers and of course to all the attendees who made it a great weekend by simply being typically humanist. Talks, intellectual (and sometimes not so intellectual) discussions, good weather, games, alcohol and nice people, how could a weekend get any better?! A couple of my favourite talks over the weekend were by Leon Korteweg about Guerrilla Skeptics and learning more about the work IHEU and the BHA do from the talk by Bob Churchill and Richy Thompson. Since I’ve got back my Facebook friend total has increased and my knowledge of humanist groups and endevours has widened. Definitely something I’d like to do again next year! It was fantastic not only to be part of the weekend, but, for the first time ever, to be part of a delegation of 18-35s representing the newly formed Young Humanists UK. We all thoroughly enjoyed being part of a bigger conversation, and look forward to playing our part in the worldwide humanist project. If you want to be part of the next delegation, get in touch.